follow-up (June 19, 2010): See today’s New York Times article, “Peddling Relief, Industry Puts Debtors in a Deeper Hole” (reg. needed) and check out our earlier posting, “Doubts over Debt Negotiation Fees” (July 21, 2008). Whatever the outcome of the criminal trial, I believe that the Capoccia Scandal — the enormous harm that Capoccia’s lawyers perpetrated on their clients — could have been prevented if bar counsel had done their duty in 1997 and 1998, when Capoccia’s debt-reduction business was launched and spread across New York State. Instead of acting, they found excuse after excuse for not even investigating, leaving many thousands of clients to the wiles of Andrew Capoccia and his law partners. 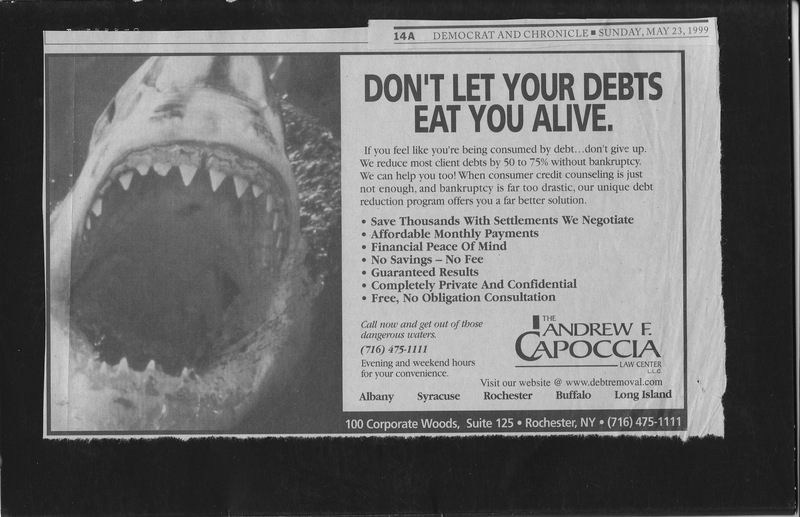 Capoccia had a massive ad campaign in newspapers and on radio and tv for a couple years in Upstate New York, for his “debt-reduction” services (See, e.g., this 1999 ad (which ironically featured an image of a vicious shark), and this earlier TBED ad.). He claimed to be able to reduce your debt levels dramatically, without putting you in bankruptcy, while charging only a “small part” of the savings. The ads were aimed at people who wanted to avoid bankruptcy — and, had enough money to afford his fees. In December, 1997, as I briefly describe here, after speaking directly to Andrew Capoccia and members of his staff about his services, I tried to get bar counsel to investigate Capoccia’s practices, which were, on the face of his giant one-page ads, clearly suspicious. My interview with Capoccia confirmed that the services were excessively priced (many thousands of dollars in advance, for eventually sending form letters to creditors, in which he hinted the client would go bankrupt without a major debt reduction; the fee was determined by an optimistically-forcasted percentage of debt-reduction savings — as much as 70% of your debt — and with the contingency fee set at 25 to 27% of such savings). Besides not involving any real lawyering, the services were also clearly harmful to clients, who were advised to immediately stop all payments of all debts, in order to put pressure on the creditors, thus ruining the credit status they were trying to salvage. Despite my two formal complaints, and those of dozens of clients, and in the face of newspaper articles filled with client horror-stories, bar counsel never took action against the conduct that hurt clients, allowing Capoccia to amass tens of millions of dollars (and later hide most of it). When Capoccia was finally disbarred, it was because several courts (and credit companies) were angry at him for a flood of frivolous lawsuits. The Grievance Committee in Western NY finally said it would investigate client complaints in early 2000. However, when Buffalo/Rochester Committee heard that the Albany Committee would be looking into the judges’ complaints, they stopped their investigation on behalf of Capoccia’s clients (including mine focusing on the excessive fees), saying they would “defer” to the Albany office. They could have continued their investigation or transferred the files to Albany to consolidate the complaints. This lawyer scandal and client catastrophe could have been avoided — minimized and stopped in its tracks — if bar counsel acted responsibly and competently when the first barrage of suspicious ads came out in 1997; or when they received detailed complaints from myself, a member in good standing of the bar; or when they were flooded with client complaints (which at first were not even accepted, but were instead referred to the State Attorney General’s office); or when newspaper and tv reports emerged about angry and injured clients. Or, or, or . . Instead, toothless and blind watchdogs did nothing, while their cousin the wolf (with main offices on Wolf Rd. in Colonie, NY) plundered the flock. There is little chance of reimbursement for the cheated clients and many may never be able to repair their bad credit. If our watchdogs don’t spring to action when many thousands of desperate, uninformed and unsophisticated consumers are paying millions of dollars in excessive fees (for services that actually harm them), when will they choose to act? Plainly, consumers believe, and should be able to trust, that heavily advertised lawyer services have been scrutinized and pass ethical muster. Our Attorney Grievance committees must have the procedures, policies and personnel needed to act quickly and effectively when the rights of vulnerable clients are at stake. Part of the problem is funding, but a significant part is attitude and commitment. How many sheep need to be devoured by the wolf before our watchdogs wake up? Before the watchdog starts looking like just another wolf in bureaucrat’s clothing? At this point, I believe that the failure of our professional “watchdogs” to act in a quick and definitive manner to review Mr. Capoccia’s much-advertised debt-reduction practices and to protect the public from inappropriate conduct is the most important issue raised in this case — more important than what happens to Mr. Capoccia. “Seeing what I’ve done, I’m not sure I have, um,” he said, pausing and looking down, “the character to practice law.” Sinnott pleaded guilty in February to two felony charges of interstate transfer of stolen funds. 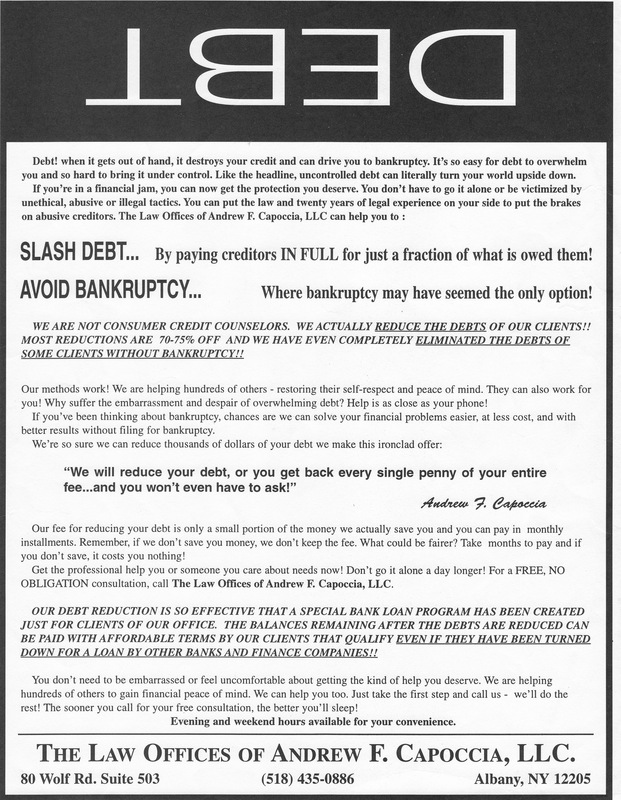 March 25, 2005: In a reply to a Comment from MyShingle‘s Carolyn Elefant, I make suggestions for lawyers hoping to cash in on the new bankruptcy laws by offering debt-reduction services.
. . . I’m pleased that Judge Murtha has finally given a serious sentence in this case, but I’m still angry on behalf of the unnecessarily injured clients and the unnecessary additional blot on the reputation of lawyers. Effective lawyer discipline — especially the willingness to investigate clearly excessive contingency fees* — would have saved a lot of people a lot of misery. (Feb. 3, 2006) Given the importance of the disciplinary system aspects of this case, Your Editor is pleased to see that the above post is the 1st result today in the Google search for [andrew capoccia]. update (Nov. 2007): See “Suit Accuses Court Panel Of Cover-Up” (New York Times, Nov. 1, 2007), which begins “A former lawyer for the state court system, fired in June from her job investigating lawyers charged with misconduct, has charged in a federal lawsuit that supervisors ”whitewashed” some cases for ”personal or political reasons.” Plaintiff is attorney Christine C. Anderson. Where is Mr. Capoccia housed now? I checked the Federal Bureau of Prisons and it says he’s not there yet there is a release date listed of 2019. The debt settlement industry sure has their share of the good, the bad, and the ugly.